It’s back to school season which means many of us parents are scrambling to figure out “what do I (or my kids) pack for school lunch?” I (Caitlyn) am honored, excited, and overwhelmed joining for the first time the rank of parents and caregivers that are packing up their little lovebugs and sending them off to school! Whether school is a car drive a way, the destination of the sea of school buses, or across the kitchen table, back to school season requires some prep. With school starting last week for my kiddo, I’ve been in the thick of washing school clothes, packing his backpack, and planning lunches. This week I want to share with you my round up of healthy school lunch ideas. Below you’ll find a couple Living Wellness original recipes and a bunch of links to other websites. Bookmark your favorites for later! I'd also love for you to share in the comments below your favorite school lunch ideas. Veggies You Never Thought You'd Love: Rainbow Bacon? When they said “Eat the rainbow 🌈” they never said that couldn’t include bacon! Weeknights can be a little crazy to get a meal on the table, let alone one with a side dish or a veggie. Even if I do manage to quickly whip something up with a veggie or two, it seems like I turn around the the dishes behind me in the sink have multiplied. That's why I've really been getting into sheet pan meals. One pan. One meal. Endless possibilities. For this month's Veggies You Never Thought You'd Love recipe blog post, I wanted to share with you a tried-and-true favorite in our household: 🌈 Rainbow Bacon. Yes 🌈Rainbow Bacon is packed full of veggies as the name would imply :) Okay in all seriousness the heart of this sheet pan meal is the bacon and you can toss in whatever veggies you have on hand. This recipe started out with onions, Brussels sprouts, and bacon but has morphed into so much more. The recipe below is by far our favorite. How did I come up with it? Honestly I opened up the fridge, freezer, and pantry and asked my toddler which veggies he wanted for supper. His first response was "bacon!" "No, what veggie do you want with your bacon?" :) We came up with the list of veggies below, some of which I knew he wouldn't eat, but as I said in our last post in this series: walk the walk. I'm sitting beside Lake Geneva in MN watching the sunset as I finish this blog post. I actually sprinted from my guest room to get a glimpse of the space between light and dark, feeling the cool lake breeze on my cheeks. There really are some things money can't buy. God is the ultimate painter. There were times and seasons in my life when I would get really upset about all of the things I couldn't buy because I didn't have the money. It wasn't until more recently that I realized my problem wasn't ever about not having enough money, it was about my attitude toward God. Anger and frustration about money wasn't the problem; it was about not having enough God. That was not a problem with God though...he is always enough. We need to check out heart to see who (or what) is on the throne. God has given me everything I need. He cares for me in every way. However, when I focus on my lack, God leaves the equation. When I focus on God's abundance and providence, God becomes the center of my life and I am content. I have enough. The same is true about food. Whether you are on a budget, you have food allergies/sensitivities, or you're just a picky eater, it's easy to focus on all the things we CAN'T have. Have you ever done that? I have. It puts my heart in a bad place. My attitude of self-pity is usually taken out on those around me. 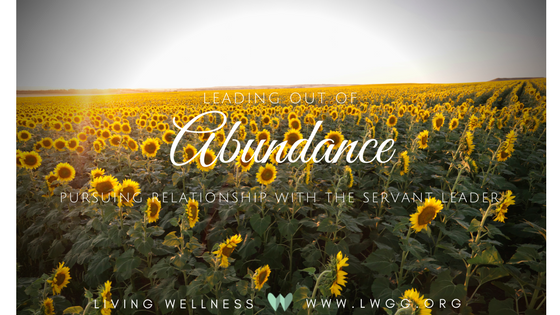 However, as soon as I make the switch to looking at the abundance that God has provided for food, my heart is instantly grateful and calm. 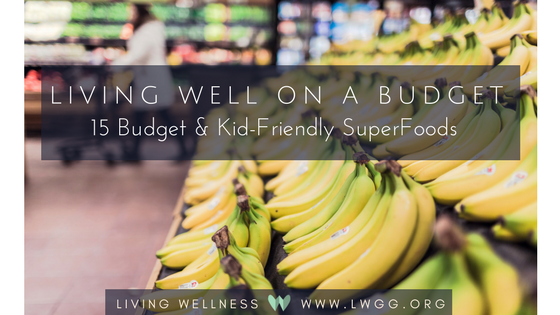 Below is a list of budget and kid-friendly superfoods. Rather than taking an attitude of "Ugh, I'll never eat those or my little people will never eat those. . . " be still, my soul. My encouragement for you is to start with one pantry item at a time. Once you have mastered that one item (or meal), add another budget-friendly super food to your diet. Also, we have a fun new blog series called Veggies You Never Thought You'd Love that gives one family friendly healthy eating tip (focused on helping your kids be more accepting of new foods). Type this title into our search bar to see all of the blog posts and stay tuned! A new post is release each month and our next one is next week which features a veggie dessert! We climb mountains one step at a time. We nourish our bodies one bite at a time. Blessings! This picture makes a momma heart proud. It’s a picture of progress. It’s a picture of healing. It’s a picture of food freedom. Although you may just see a toddler’s plate for a mid-afternoon snack, what I see is tiny taste buds that have shifted sloooowly with tons of love and guidance. Not just talking about my son’s taste buds but mine. Yes he went through the typical toddler picky phase but his started to go deeper than that. I couldn’t see it at first because I was blinding by the ease of serving him what I knew he’d eat. I saw it after I slammed the fridge door frustrated that I had served him the same meal 2x that day not counting how many times that week. I saw it as I watched the meltdown at the table when daddy offered a bite of carrot. I saw it when I looked in the mirror. You see this plate is really a mirror. He eats what I eat, that is, what I eat now. Food and I go way back. 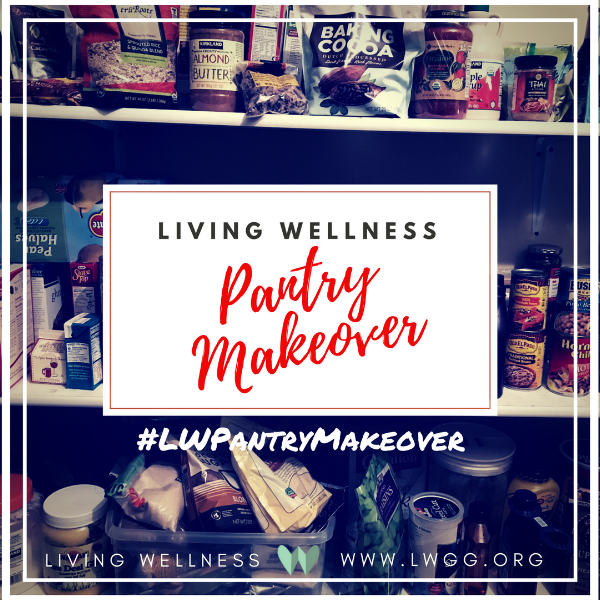 The Living Wellness Pantry Makeover Series is back for 2018! Check out our first two posts here and here! Well welcome back our Pantry Makeover Series. I (Caitlyn) am excited to welcome you into my pantry to see a few of my favorite pantry staples. At Living Wellness we strongly encourage focusing on as much whole, unprocessed foods as you can. For that reason, I've included a few pantry staples that I use in conjunction with whole-foods to make meals or snacks. For many people who have recently changed or thinking about making changes in their health or wellness routines, the holidays and health can be stressful. Will I be able to keep up with my typical wellness routine with holiday parties, family time, work commitments? Maybe I should just skip working out or watching my calories until after the holidays, I mean could I really do it anyway? What am I going to eat at that holiday party...or...do I really have to avoid all of those amazingly delicious looking treats to follow my nutrition plan? "The ultimate goal of eating is to nourish our bodies. My personal goal is to eat for nourishment 95 percent of the time and reserve that last 5 percent for healthy, natural treats" Living Wellness for Growth Groups, 2017, p. 20. During this holiday season, we want to empower you to continue to make choices that will nourish your body, mind, and soul. That's why over the next 4 weeks we're going to be sharing some great resources with you to thrive during this season. As we jump into the first week of October, I am greatly looking forward to more beautiful fall days ahead. Yesterday, we enjoyed a beautiful crisp yet sunny day, while today we're blessed with a nourishing rain that helps to bring out the fall colors. As the rain patters near me on the windowsill, I can hear the birds chattering among the falling raindrops. It is funny how they sound different in the fall than they do in the spring. I am no bird expert, but I believe this may be do to the migration process. There are different birds visiting in the spring than there are in the fall. In some ways, these changes of the season are like the changes we see in the foods we eat and crave at different times of the year. In our household, our food preferences change often, even within a season If your household is like mine, your family goes through various 'food kicks.' Meaning, there are certain pantry items that you keep well stocked for everyday life, but after a month and a half, everyone is tiring of the pantry staples. At Living Wellness, we are always looking for nourishing foods that require little preparation while also pleasing to the whole family. With that in mind, we want to introduce you to our Pantry Makeover Series. Each posting will include a few pantry items that the Living Wellness staff enjoys! Sometimes, all it takes is someone to present an idea to you before you are able to embrace it and make it part of your wellness routine. I can't play volleyball like I used to. I can't run without my knees hurting. I can't take long strenuous bike rides because I don't have the energy. When I get in a new season of setting goals and committing to being healthier, I sometimes find myself falling into the "I can't" trap: focusing on all the things "I can't do." However, when I reflect on the seasons of my life when I’ve made positive progress, I'm usually focusing on all the things I CAN do, even if they're SMALL things. This week I'm committed (with the help of my accountability partners) to get rid of the I can't's and I'm going to focus on one thing I can control-- what I put into my mouth. With a lifetime of experience to look back on, I admit that I'm always healthiest when I focus on eating plenty of vegetables. The Days of Boring Lunches are Gone! It is full-on back to school season for many of you: buying supplies, checking out class schedules, planning curriculum... it's a busy season! We know full well how peace and rest can seem nonexistent during these times. Living Wellness is committed to giving you encouragement and strategies for maintaining balance during busy, and may we say stressful times, such as this season. Check out this post on rest and stayed tune for an upcoming post on peace during these seasonal transitions. Does your back-to-school prep include planning lunches? For those of you who are not in the back-to-school whirlwind, keep reading! Lunch prep tips are valuable to anyone who, well, eats lunch!! In today's post we're giving you tips for lunch time content and what contains that tasty lunch. Happy lunch-ing!! Need A Little More Spice in Your Life? If you were to walk into my kitchen and ask me what my favorite thing was in it, can you guess what it is? Drum roll please.....my spice rack. In the midst of Marc and I wielding our scanner guns around Macy's, I paused and saw this beautiful stainless steel swivel spice rack. I lined up my scanner gun, hit the button, and added that beauty to the list! Five years later, our spice rack is still holding up well; however, the contents of that spice rack have changed dramatically. A few years ago it donned on me that I had no idea what quality of spices lie in my spice rack. How long have those herbs been sitting on the Macy's shelf before I bought them? Are they organic? Where are those herbs from? This nutritional yeast package in my pantry already has the new FDA food label! Each of these ingredients put up red flags in my mind. My general and not-very-scientific rule is: if I can't pronounce it or don't know what it is, I need to research it before it's going in my mouth. Needless to say, I put that can back on the shelf and quickly walked away. Now, I'm definitely not slamming all packaged foods. They serve many purposes and you'll definitely find some in my pantry; however, I've come to inspect the foods we place in our pantry and fridge through the lens of the information below. Live informed, not in fear, of the foods you eat! If family camping is a memory from your childhood, you know what it is like to prepare for an outdoor family event. Packing your favorite outdoor toys and games was something to look forward to. Games like Frisbee, bean bag toss or lawn darts were fun events for my family! One of my favorite memories is when we would travel to my grandparents house and camp out on their lawn in our camper. We enjoyed each day with the games that we had brought, spending time together as a family, and our time boating on the lake. Our evenings would wrap up with a game of hide and seek and then a bonfire with our favorite treat, a smore, and sometimes watch fireworks! Do you have memories from your youth about camping that you can reflect on? How can you include them in your camping adventures this summer? If you've never been camping and this post inspires you to take your first family camping trip, let me share a few ideas for packing fun summer games and activities. Grab a pen and paper and let's build your packing list! This is our final segment in our series on how to eat healthy on a budget. Check out Part 1 and Part 2 for more healthy eating tips! Now that we have defined “Healthy” foods in last week's post, what should our plate look like for meals and snacks? At Living Wellness we follow the recommendations of Dr. Natasha Campbell-McBride, and researcher Westin A Price. They considered the government’s MyPlate model and took it a step further to create a plate that takes one’s whole body and nutritional needs into account. To nourish all the cells and systems of your body, you need macronutrients (protein, carbs, and fat), micronutrients (vitamins and minerals), water, and healthy bacteria to maintain proper gut balance. The sample plates below are guidelines on how to properly nourish the body. We at Living Wellness love to eat tasty and nourishing food while also not breaking the bank. 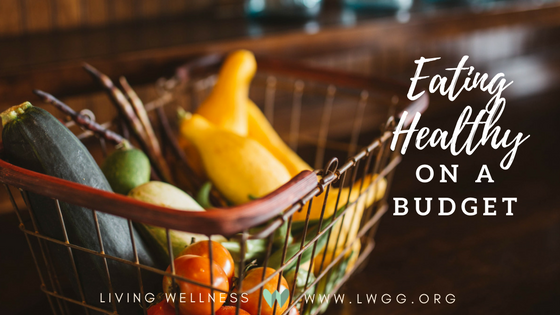 That is why we are continuing our series “Eating Healthy on a Budget.” In today’s blog post, we're sharing part one of Living Wellness team member Julie Frandsen’s presentation from Bridging the Gap’s Single Mom’s Retreat which wrapped up this weekend! What a wonderful time of encouragement and blessing. Today we are going to talk about one of my favorite topics: Food!!! I love to cook and provide good tasting, mouth watering, nourishing meals and snacks for my family. If am I honest…sometimes I am successful at doing this, and other times not so much. My hope is that you will learn some practical tips of how to save money at the grocery store while also not compromising the quality of the foods that you buy. First things first. In order to talk about healthy eating on budget, we first need to know how to eat healthy! I want to celebrate the mommas that have many children and those who have few. Those who have alive children and those with angel children. And I want to celebrate those women with a strong momma heart but for one reason or another do not have children, your momma heart deserves celebration.